Exfoliating and Cleansing gel with microcapsules. Marine Cleansing Gel re-mineralises and energizes the skin. Extracts of sea sediments rich in trace elements such as zinc, copper, manganese and cobalt. Assure a smooth peeling eliminating dead cells. Irritation-free skins of any age. Marine Cleansing Gel microcapsules dissolve when rubbed and release a polyolefine gel that gently polishes your skin. It ensures a deep cleaning while lifting away the superficial dead cells. Your skin becomes exceptionally smooth and radiant. Gently massage a small quantity of Marine Cleansing Gel all over the face and neck with wet hands but avoid the eye area. Rinse with lukewarm water. Perfect for use under the shower. 2 out of 2 (100.00%) reviewers recommend Marine Cleansing Gel to their friends. I have just discovered this fabulous cleanser and I am hooked! 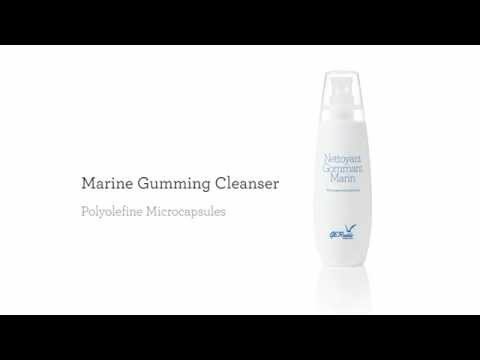 I use the marine cleanser a few times a week for a deep clean. It gently exfoliates and my skin looks amazing afterwards! [post_content] => Exfoliating and Cleansing gel with microcapsules. Marine Cleansing Gel re-mineralises and energizes the skin.